Before we begin this review, we should make it clear that Coins.ph is indeed a legitimate operation. Defining it is a little more difficult, because it is essentially a service that branches into several different verticals and that raises a lot of questions – regarding various operational aspects and NOT legitimacy – with its users, to this day. Because this is indeed a Philippines-focused service, most of the online forum discussions regarding the above said operational aspects – happen in a weird mix of English and what we assume is Filipino. Even the promotional video featured at the home page of the operation uses this mixed language. The general community buzz about Coins.ph is overwhelmingly positive, with many of its users squarely proclaiming it the best fiat money- and Bitcoin-transfer service in existence. Above and beyond the cryptocurrency-related aspect though, Coins.ph offers a whole suite of other fintech solutions, such as the topping up of prepaid mobile phone credits, bill payments, remittances and online shopping. While users and potential users from world-over can register an account with Coins.ph (with the exception of a handful of countries listed at the Coins.ph website), not everyone can use all the services offered by the operation. Indeed, some of these services, such as the paying of the bills, are pronouncedly local-focused, so it is not exactly surprising that someone from the EU for instance, cannot make use of them. Wallets belong among the services peddled by Coins.ph. In this regard, there’s a PHP (Philippine Peso) wallet and a Bitcoin one. The balances of these two wallets can be converted back and forth, so “buying” Bitcoin through Coins.ph is indeed possible. Conversions have to be requested manually, and one has to pay attention to the Buy/Sell spread featured on Bitcoin by the operator, because there certainly is one. Otherwise, the creation and maintenance of these wallets is free. Money can be deposited with Coins.ph through a variety of methods, including Globe Gcash, online bank transfer and bank ATMs. Upon making the deposit, users will have to choose between the PHP and Bitcoin wallets. If the Bitcoin wallet is ticked, the transferred amount is automatically converted to BTC. While there are fees involved with deposits, the site is 100% transparent about them, and users are filled in on all deposit-related details before they confirm the transfer. Cashing out is possible through a wide range of methods as well, which means that local users can use the service as a sort of bank account-less solution for quick and efficient money transfers. In addition to all the above listed services, Coins.ph runs a rewards program, which makes it possible for its users to “earn” money out of nothing. Bringing other users into the fold entails a PHP 50 reward, which can then be converted to BTC. If you’re considering the service as a way to generate BTC for free, you may want to think again. The USD and even BTC yield of this rewards-program is extremely low, and there’s an ungodly amount of verification-related bureaucracy involved. There are a number of promotions running, which target various services, such as the purchasing of prepaid mobile phone credits, bill payments and even ID verification. Coins.ph was launched back in 2014, by Silicon Valley’s Ron Hose and Runar Petursson. The operation is targeted at South-East Asia, including Thailand and the Philippines. Its main appeal is that it allows people from a nation with relatively poor bank penetration (42% for the Philippines) to use financial services without a bank account. Coins is certainly convenient, safe and inclusive for individual users, as well as businesses, which can take advantage of its remittances features, but the whole thing is pitched as a perfectly transparent setup from the point of view of the government. Coins make their blockchain accessible to the government, so users can be audited based on information provided by the operation. Judging by the feedback of the global community, you can indeed trust the service. It seems to be a straight shooter from every angle, even though – as always – some might feel tempted to abuse some of the features it offers. There aren’t really any concerning the viability/legitimacy of the operation. With its plusses and minuses, Coin.ph is legitimate and apparently here to stay. Interestingly, we tried our best to rustle up a negative comment about the operation and have thus far come up empty-handed. Everyone seems to be happy with what Coin.ph has to offer, and what’s more, they seem to be happy about the fees involved as well. Some international users want to know exactly which features they are able to use at the site, but they are hardly complaining. We seriously doubt anyone in the EU would want to pay a bill with a Filipino utility company anyway. As of December 2017, Coins.ph is ranked 14,027 globally, according to SimilarWeb. More than 80% of their visitors are located in the Philippines. A small percentage of visitors come from Japan, the United States, United Arab Emirates and Saudi Arabia among other countries. 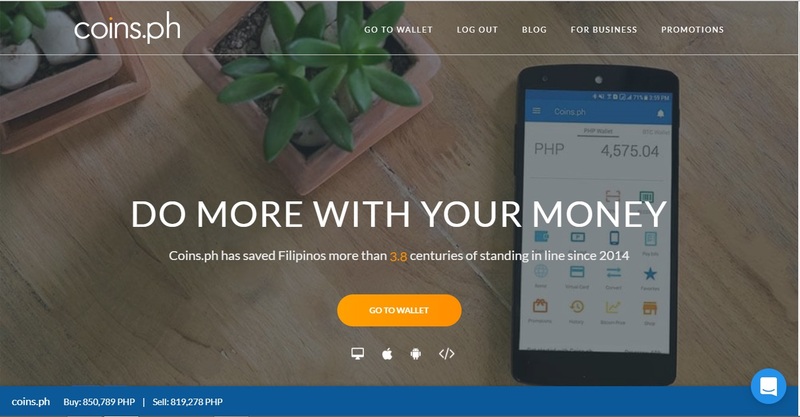 For its Philippines-based users, Coins.ph is a sort of fintech godsend. Through it, users gain access to a bevy of financial services, circumventing the banks and their commissions. Funds can be sent and received, remittances can be settled, phone credits can be bought, not to mention the Bitcoin wallet feature and the Bitcoin purchasing feature. For foreigners, these services are mostly limited to the use of the Bitcoin wallet. The international users making use of the wallet, seem mostly pleased with its security and with the way it works. Please share any feedback, thoughts or experience with Coins.ph – positive or negative – by leaving a comment below. Back to Cryptocurrency Exchange Reviews. 100% legit. I have been using coins.ph for quite some time now and what I like about it is that I’m really benefitting from using it. It’s like pay and earn at the same time. Buying load is really much faster and you get to claim 10% rebate instantly. You can save time and skip the long line standing paying your bills when you use coins.ph and you also get to have Php100 rebate for every five unique bills you pay weekly. This is on top of the Php5 you earn for every bill you pay. And there’s no limit to it. You can pay bills as many as you want as long as the bill is considered unique. Another advantage is that you can cash in (load money in your coins.ph wallet) for free. Yes FREE, you’ve read it right. I always cash in through Unionbank because it’s absolutely FREE! You can do it via cash deposit or online deposit, either way is free from bank charges. If you have a bank account in Unionbank, that’s good news because you can also save time and skip the long line at the bank. When it comes to security of the account, you can have your peace of mind when you use coins.ph because your account here is secured. As for me, I use Google Authenticator just to add another layer of security to my account (you can have it googled or watch it from YouTube to learn this tool). The support team of coins.ph is superb, very accommodating! Kudos to them! I e-mail them once in a while when I’m having trouble with rebates. The only thing that I think coins.ph should improve on is their remittance of the Php100 rebate for the five unique bills paid because based on my experience, it has been almost, always delayed. That’s my honest to goodness review on coins.ph. CEO COINSPH WANT EAT WE MONEY! Really how much is your fund? I AM ALSO A VICTIM OF COINS.PH UNFAIR TRADING PRACTICES. HIGH TRANSACTION COST, AND ONCE YOU HAVE MANY COINS OR YOU ENCASH MORE THAN 250,000 PESOS EVEN IF YOU HAVE LEVEL 4 LIMITS, THEY DISABLE YOUR ACCOUNT AND FORCE YOU TO SELL YOUR COINS TO THEM.